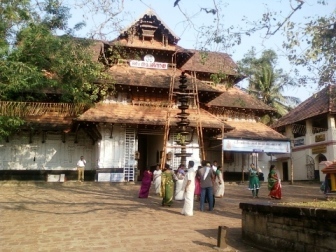 Vadakkumnathan temple is a very popular Shiva temple of Kerala. The temple has many murals and art work adoring its walls and is a marvelous place to feel closer to the Lord. . This temple is a classic example of the architectural style of Kerala and has monumental towers on all four sides and also a kuttambalam.The ancient temple is surrounded by a massive stone enclosure, covering an area of 9 acres. The main three shrines are dedicated to Shiva as Vadakkumnathan, Shankaranarayana (a combined form of Shiva and Vishnu) and Lord Rama. 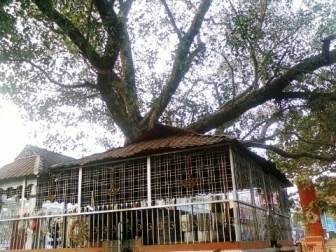 The temple is located in Thrissur city, and closer to railway station. I had visited this temple many years ago with my family, but recently I got a chance to visit there again, on my way back from Guruvayur temple. According to legends, Shivaguru-Aryamba couple of Kalady, prayed Lord Shiva for a child and Shiva appeared to them in their dreams and gave them a choice. The choice was whether they wanted an ordinary son who would grow and live long, or an extraordinary son with short life span, and they opted for the second. As per their wish, they got a son who was named Adhi Shankara. It is said that Adi Shankara attained Videha Mukti at Vadakkumnatha temple. The main festival of this temple is Thrissur Pooram. The world famous Thrissur pooram is celebrated here every year in April-May. This spectacular festival is a grand assembly of Gods and Goddesses who make their visit to the Vadakumnathan Temple premises on caparisoned elephants, along with the majestic ensembles of Chenda Melam and Pancha Vadyam. Thrissur pooram is called as the Pooram of all Poorams, and all communities of people participate in this grand festival. It was started by Sakthan Thamburan, the erstwhile ruler of Cochin. The surrounding ten temples participate in this pooram. Among them, the two main temples who participate are Paramekkavu and Thiruvambadi. During the Pooram, the grounds of this temple is one of the main venues for the festivities and grandeur to be showcased. Shivarathri festival is celebrated with great grandeur, when the temple is lit with over one thousand lamps. Only Hindus are allowed to enter the temple. Men have to enter removing their shirt. The temple is set right in the midst of the city and can be easily reached by cabs or autorikshaws or by driving. The railway station is just two kms. away.